This year my family tried out the Troy-Bilt Pony Riding Lawn Tractor. Before I tell you what we thought of it, I thought I should explain what we’ve been used to cutting the grass with, so you know where we’re coming from. Since 2002 we’ve been mowing our lawn and fields with a 15hp DR Brush Mower, mowing the lawn with the 42″ mowing deck. 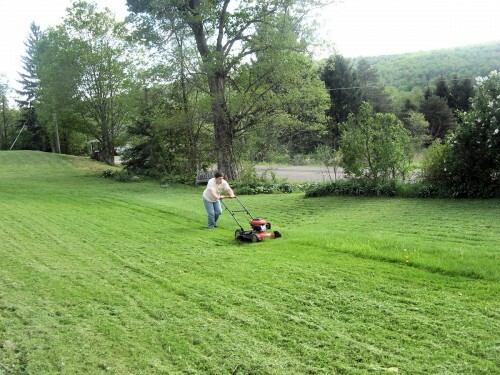 In the good ol' days, this is how we mowed our lawn. But it started developing problems in 2008, which we didn’t resolve before the end of the season. 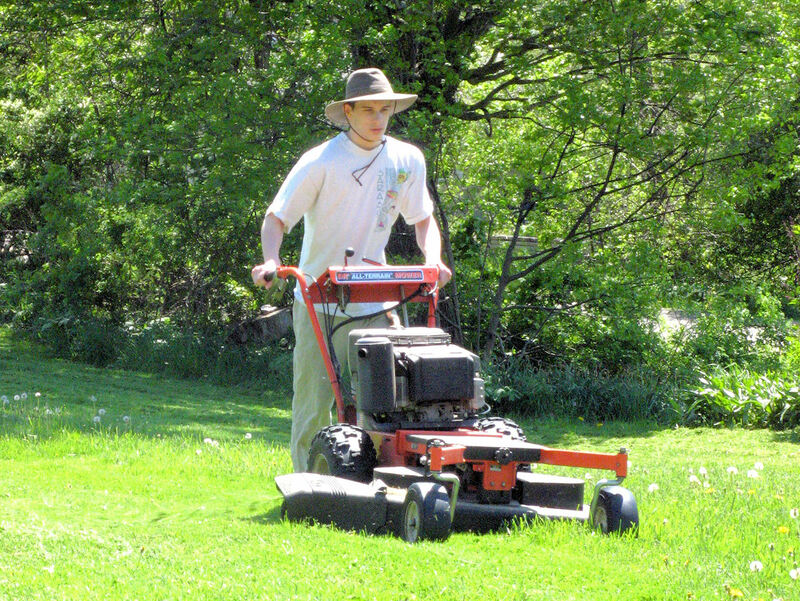 We had hoped to get it running again properly in 2009, but as time went on with no resolution in sight, we broke down and bought a modest push mower to tide us over, a Troy-Bilt 540 Series. We bought a push mower to tide us over. As we went through our various repair options for the DR Brush Mower, from doing the obvious maintenance, consulting with their technical service department, and bringing it to three different repair shops, it became clear that the lawn mowing days of the brush mower were over. It was too difficult for the average teenage boy to handle, so must be relegated to field mowing only, and that, only by the strongest members of our family. You know, the ones that bench press over two hundred pounds. For the rest of last year, that modest little mower was the lawn mower. So when the Troy-Bilt representative contacted me to offer the chance to review their Pony Lawn Tractor, I said yes. It has a 42″ mowing deck, just like the lawn deck attachment for the brush mower. And it’s a tractor, so it should be able to mow the field, right? Wrong. For the Pony, “tractor” is a misnomer. Sure, the manual refers to a PTO (power take-off), which all tractors have, but this machine doesn’t have enough power to cut six-inch high grass, which is how high we let it get inside the chicken yard and around the apple trees. We repeatedly expected too much of it and broke it. First, an old goldenrod stem got caught in the underbelly of the machine and completely jammed it up. Later on, the transmission belt broke. Of course that is the one thing you are not supposed to fix yourself. But we managed to replace it without air/impact tools or instructions. It helps being stubborn, independent, and frugal. To be fair, when cutting the more typical lawn, it did the job. But it didn’t have the maneuverability of the little push mower, and often, after going around the shrubs with the push mower, the boys just kept on using it for the rest of the lawn. I guess it seemed easier than going back through the chicken yard to get the riding lawn mower out of the shed. It cuts lawn grass satisfactorily. “Every time I went over a bump, the engine shut off.” This was due to the safety feature that shuts off the engine if the operator leaves the seat without the brake being on. Except the operator was still in the seat. “The mowing deck doesn’t float and it scalps the lawn.” Of course, if you were mowing a bona fide lawn there wouldn’t be so many humps and bumps to scalp. We have many seeps and springs popping up during mud season, leaving the surface of the lawn uneven. Bottom Line: this riding lawn mower was designed to cut lawn grass on a level surface. It was not designed to cut converted pasture on rough, sloping ground, especially if it was (ahem) past due for a mowing. Thank you to Troy-Bilt for generously providing the mower for this review. If I were you, I’d go for some sheep (mmm, socks…) or some goats (mmm, chevre…). I just want to make some comments here since I am a fan of Troy-bilt equipment from years back although we had not owned one till lately. One needs to make several observations. 1) These are now built by MTD (http://en.wikipedia.org/wiki/MTD_Products) and if you lined up their lawn tractors from all their brands, under the covers you would find very little difference in the same models by size of engine and cut. The old Troy-bilt quality is definitely not there. And in Canada we can only buy the new ones from Canadian Tire at this point. I suspect the early Troy-bilts were somewhat over priced but the quality was definitely there. 2) A lawn tractor is exactly that. They are designed to cut the recommended 3/8 to 1/2 inch of grass blade for good lawn maintenance. They also do not have traction tires to prevent lawn damage. 3) Your story is so typical of us here. We live on an acreage (34 acres or so) and our yard is not a “Lawn”but an old farm yard. Yet I have cut every week this past summer at about 3.5 to 4 hours a cut. Including the ditches along the front of our property which have at least a good slope. Great care needs to be taken but I usually cut along the slope rather than up and down. Just is more practical. But the tractor really only spins out when the grass is damp or it gets over-centered by the slope as only one tire will drive if there is lack of pressure for traction under both back wheels. The model we have is from about 3 years ago and it has done very well. Just a side note – this, like all “lawn tractors” is not built for folks with long legs or heavier weight as they are built to be compact. I have hauled mine on a home-built deck in the back of my old Voyager mini-van! Our expectation is usually beyond what these little units are meant to do! 4) The durability in lawn tractors is in the “un-noticables”. Things like size of the front axles and the main axle beam. Check this against a John Deere in the 400 series from the 80’s and 90’s for instance. 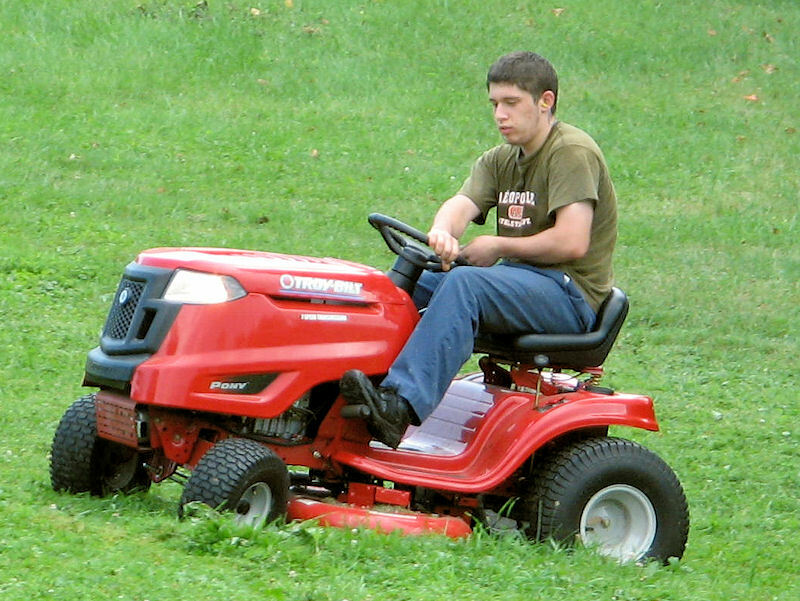 Most lawn tractors are lightly built and do not have bearings in the wheels for instance. This is not new as I remember buying an Allis Chalmers lawn tractor a number of years ago and finding all the little nylon wheel bushings worn out. Bah! The steering columns are of the same ilk and usually have the same bushing or similar and that is why they seem to have a lot of “play” after what seems a short use. Another thing to look for is the seat springs size. Usually too lite for the average male at least. I am not sure if they think small men and women, and children are going to operate these but there is definitely an issue here on most brands. 5) We get what we pay for for the most part and even though a Troy-bilt is still more expensive here than an MTD or one of their other brands of same size (can be $300 to $600 depending who is selling and if there is a sale) they will do a lot of work and can be a pleasurable change from walking behind a 22 inch push mower! Been there, done that! Thanks for sharing these thoughts but I think you might have been a little over expectant. Just my opinion. Thanks for taking the time to write such an extensive comment, Clayton. I am sure we were “a little over expectant” as the brush mower is a lot more powerful–and expensive. You are right: you get what you pay for. I use a husqvana 18.5 hp lawn tractor with a 42 inch floating deck to cut my 2 acre property. There is a slope that I cut along the length and not up and down as the manual suggests. I have been using it for just over five years. I use it once a week in the rainy season and every two weeks in the dry season. I just change the oil and filters every year. Have never changed the belts so far and have changed the blades once. I have gone through 3 batteries since they do not have a long shelf life in the tropics. I would like to invest into a garden tractor since they are more powerful than a lawn tractor but I can only go with what I can afford. I bought mine in Miami and shipped it to my island home. Yes I pay 2 -3 times more for everything I buy but that is life on an island. Troy Built is available here on the island as well at very high prices. I have heard good things about Snapper as well , but the proof of the pudding is in the eating. Sounds like they have a bit of redesigning to do. One would hope anyway. I find many of their items are built to break. That is one way to retain job security and more sales I guess.